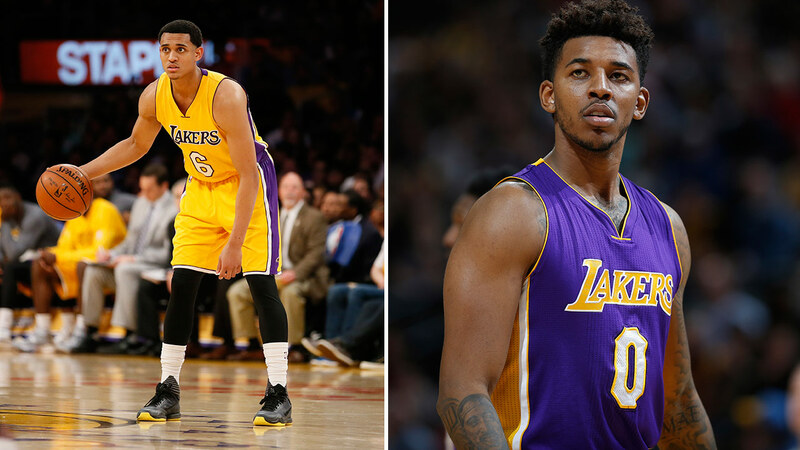 Jordan Clarkson (left) and Nick Young (right) are accused of sexually harassing two women in Hollywood, according to ESPN. HOLLYWOOD, LOS ANGELES (KABC) -- The Los Angeles Lakers are investigating allegations that two of their players sexually harassed two women in Hollywood Sunday evening, according to ESPN. ESPN reports that the two players were guards Nick Young and Jordan Clarkson. One of the alleged victims was Alexis Jones, an author and co-founder of the nonprofit I AM THAT GIRL. In a post to her Instagram page on Sunday, Jones said four men pulled up at a red light and started yelling and making vulgar gestures at her and her mother. Jones said the incident happened at Melrose and La Brea avenues. Lakers spokesman John Black told ESPN the team is looking into incident and takes the matter "very seriously." Young, a Los Angeles native, has played with the Lakers since 2013. He is engaged to Australian rapper Iggy Azalea and is the cousin of rapper Kendrick Lamar. Clarkson is in his second season with the Lakers and was named to the NBA All-Rookie First Team in 2015.